I suppose I should say “Happy New Year!” as this is my first post of 2015 but it seems a bit late for that now so I won’t bother. Human Dad has been very busy, lots of people want to sell their houses or rent out their holiday lets this year so we have been travelling round the north west taking pics every where. That has been great fun for me too as I get lots of walks in new places. 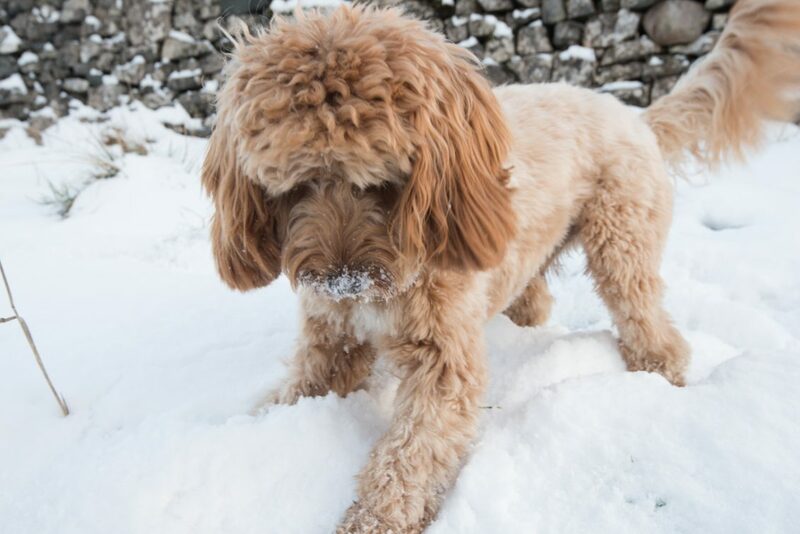 The other day we even went for a walk on some strange cold white ground – what is this stuff? Human Dad got a “big stopper” for his Crimbo pressie. Now like me, if you have to listen to all those cooking programmes that Human mum watches, you probably think a big stopper is something Hugh Fearnley Wrinkly-Balls puts in a large jar of pickles! Well its not, apparently its a special filter mainly used for landscape shots so Human dad was keen to try it out. On our way back from taking some pics of holiday lodges we went for a walk to find a nice landscape shot. The ground though was all covered in a white crispy substance I hadn’t seen before. I stuck my nose in to check it out. I tried pouncing on it too, but it just does nothing except make you cold – oh and watch out for the yellow bits they are most likely the calling card of one of my chums! Check back soon to here about my next exploits.